Corel has never been popular for its editing software, but this is rapidly changing with the recent releases of VideoStudio Pro X.10.5 and Pinnacle Studio 21. Both of these video editing options come from the same manufacturer, Corel, and each of them offers solid all-around features for consumer-level video editing. What's more, the two video editing programs have very similar capabilities which makes the choice between the two much less obvious. If you are thinking about purchasing Pinnacle Studio 21 or VideoStudio Pro X.10.5, but can't quite decide which one to choose, you are in the right place, because in this article we will take a look at the most important attributes of each of these editing programs in order to provide you with all the information you'll need to reach your decision. If you are looking for a more affordable video editing software which can do most jobs of VideoStudio and Pinnacle Studio, you should try FilmoraPro - Filmora's pro video editing software. It has a wide support for video, image and audio files, so you will not have a format compatible issue. Besides the basic editing features such as trimming, splitting, cutting or rotating, you can polish your footage with the handy audio and video editing. and edit the video with some advanced features like video stabilization, color correction and animation. Watch the video below to get more information about FilmoraPro. Obtaining a new editing software is a long-term investment since you'll be using it for a prolonged period of time. Anticipating which editing tools you'll need as your skills and knowledge develop is a sure way to pick the right software. Here are some of the most important pieces of information that can assist you in making the right choice. In order to run your editing software smoothly, you need to make sure that your computer has all the necessary requirements. The Pinnacle Studio and Corel VideoStudio have nearly identical system requirements, since both software demand 64-bit Windows operating systems, but if you are using a version of Windows older than Windows 7, you will not be able to install either of these video editing software on your computer. Furthermore, each software demands the same type of processor, Intel Core i3 or better, while Corel's video editing programs also require 8GB of RAM memory to perform more demanding editing operations. The largest difference between the Pinnacle Studio and Corel VideoStudio, in regards to the system requirements, is the amount of hard-disc space needed for the full installation of the software. Pinnacle Studio requires at least 8GB of free storage space, while the VideoStudio needs only 4GB. Corel VideoStudio Pro X10 has a slight advantage over Pinnacle Studio 21, because it is more affordable, and it requires less storage space, but all other system requirements are nearly identical for these two editing programs. Corel VideoStudio Pro X10 has a slight advantage over Pinnacle Studio 21, because it is more affordable, and it requires less storage space, but all other system requirements are nearly identical for these two editing programs. 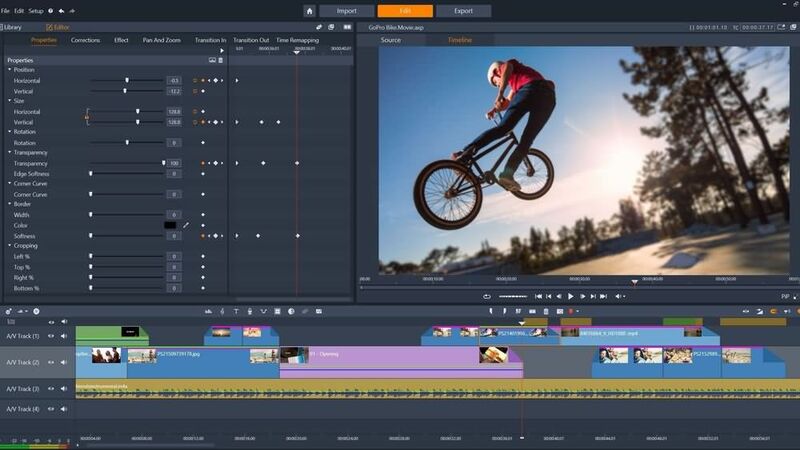 Most consumer-level video editors don't want to waste time looking for tools and options, and as a matter of fact a user-friendly interface can often be the reason why editors pick one software over the other. The latest version of VideoStudio brings a nice refreshment in the form of different modes that make editing faster and to a certain degree, less complicated. 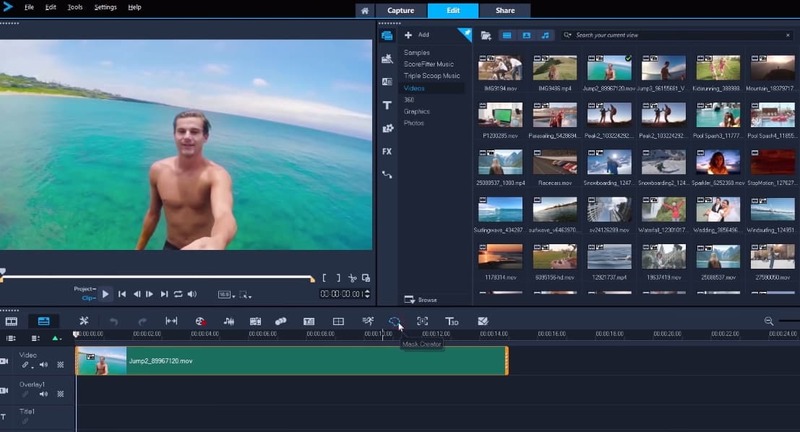 'Capture', 'Edit' and 'Share' modes clearly separate the steps of the video editing process and allow for better navigation through the software's interface. However, creating an entire project, adding overlay videos and even applying visual effects is needlessly complicated, which makes this software a weak option for inexperienced video editors. Despite being labeled as a near-professional video editing software aimed at experienced and skilled editors, Pinnacle Studio 21 is remarkably easy to use. Like Corel VideoStudio Pro X10.5, Pinnacle Studio 21 features Import, Edit and Export modes that enable its users to have a better control over the video editing process. The software also provides 'Project Bins' to its users, a feature that allows you to store all media files you want to use in a project in the same bin. The 24 track timeline is perfectly designed so it can be used for large, medium-size and small projects, and in addition, Pinnacle Studio 21 allows its users to search any type of content. Users who want to use shortcuts can easily customize keyboard shortcuts. Pinnacle Studio 21 has a much more user-friendly interface and provides significantly more options that make the editing process faster and easier than in Corel VideoStudio Pro X10.5. For that reason, editors regardless of their level of experience, who opt to use Pinnacle Studio will have a much better editing experience with this software than they would with the latest version of VideoStudio. A number of video editing options provided by an editing software is among the most important factors if not the most important factor that determines the quality and the potential of the software. Even though there is no doubt that Corel VideoStudio Pro X10.5 has a respectable capacity, it still lacks the features that would make it great. The latest version of the software will allow you to combine footage from several different cameras via its 'Multi-Camera' tool, which is a great feature for all users who need to easily combine footage captured from different camera angles. Furthermore, the software offers a 'Motion Tracking' option that can be very useful to editors who need to add moving text or blur faces. VideoStudio also enables its users to add visual effect, perform color correction or use its audio editing tools, but all of these features aren't easy to use and inexperienced editors may have a tough time learning how to properly apply them. On the other hand, Pinnacle Studio 21 offers a perfect blend of basic and cutting-edge editing features that can meet the demands of a wide range of users. The software enables you to utilize its advanced 3D features, while it also provides superb 360-degree video editing options. It helps you to quickly fix common issues with its easy to use cropping, color-enchanting or video rotation tools. 'Stop Motion Animation' feature is also on the list of amazing video editing options provided by the Pinnacle Studio 21 while applying visual effects is a simple process that takes a minimum amount of time. There is very little doubt that Pinnacle Studio 21 is a much better option in the Corel's offer of video editing software because it can be used to edit consumer-level and near-professional level videos with the same amount of efficiency. Even though VideoStudio X 10.5 is a less powerful video editing software, it is still a solid option for aspiring videographers and video editors who would like to use an affordable and reliable software to edit their footage. Corel VideoStudio Pro X10.5 VS Pinnacle Studio 21: Which one should you use? The choice between these two editing programs is not an easy one because they both provide a plethora of video editing options as well as the support for the latest video file formats which enable their users to capture their videos with the latest video recording equipment. Corel VideoStudio Pro X10.5 is the best choice if: This is a perfect choice for video editors who can't afford to pay too much for their video editing software, but still need a relatively powerful software that can provide more than just basic video editing options. However, the editors who haven't used Corel VideoStudio before must make an effort to master this software, which can be a time-consuming task. Pinnacle Studio 21 will be the best choice if Video editing enthusiasts who plan on producing videos on a constant basis and don't mind investing as much as $130 in a video editing software will reap the benefits of Pinnacle Studio 21 because the software is well-equipped with editing tools required for nearly all editing tasks. Despite this Pinnacle Studio can hardly be compared with high-end video editing software like DaVinci Resolve or Adobe Premiere Pro CC, although it is slightly cheaper, it fails to offer the capabilities provided by these video editing programs. If you are tired of looking for a video editor, why not choose Wondershare FilmoraPro? It is a professional video editing software that can power up your story. It is easy to use compared with Premiere. You will have more control over the video effects, texts, titles and transitions. Auto color correction and automatic audio sync can help you save a lot of time. So, if you want to experience a new way to edit video, download Wondershare FilmoraPro now! Adobe Premiere Elements VS Adobe Premiere Pro: Which one should I use?